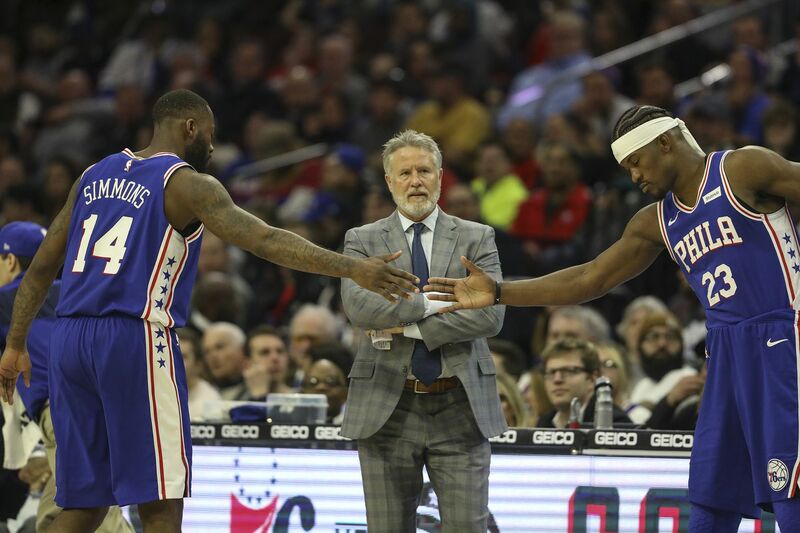 Even though the 76ers are facing teams in their upcoming two-game road trip that entered Friday a combined 27 games under .500, coach Brett Brown isn’t ready to take his foot off the gas just yet in terms of giving players some time off. With 10 games remaining in the regular season, the Sixers (47-25) are in third place in the Eastern Conference, 3 1/2 games behind second-place Toronto Raptors, but 3 1/2 games ahead of fourth-place Indiana Pacers. The difference between third and fourth place is huge, since a fourth place vs. fifth place first-round matchup would almost certainly mean a series with Boston. The Sixers don’t appear to be moving from the third spot, but Brown says all hands are on deck for Saturday’s game in Atlanta and Monday’s at Orlando. At this point, Brown says he plans to get through the next two games and then evaluate his strategy for the final eight. The Sixers are playing some of their best basketball, with all the new additions beginning to gel. They have won six in a row after Wednesday’s 118-115 victory over the Boston Celtics, who had been 3-0 against the Sixers this year, and of course eliminated them in five games in last season’s Eastern Conference semifinals. Atlanta is 25-48, but the Sixers are talking as if they are getting ready to play the Golden State Warriors. The Hawks, coached by former Sixers assistant Lloyd Pierce, are 6-9 since the break, but are coming off Thursday’s 117-114 home win over playoff-bound Utah. So the Sixers are saying all the right things heading into Atlanta. “It’s the NBA and everybody can play, and everybody can beat you on a given night,” guard JJ Redick said. “They already beat you this year, they beat Utah (Thursday), they are a good basketball team." The Sixers are 1-1 against the Hawks and 2-1 against the Magic. Orlando (34-38) entered Friday 1 1/2 games out of the eighth and final playoff spot. Redick, who is averaging 18 points and shooting 51 percent from three-point range during the current six-game winning streak, has some lofty goals for the final 10 games. “I am looking for 10 wins and 40 threes,” he said. After that, the media members laughed, as did Redick, but anything is possible -- especially since eight of the final 10 are against teams that began Friday with losing records.